Attractive, horizontal siding combines with a vinyl coating to give you a handsome and durable storage solution. Tall walls and an ample gable roof allow for plenty of headroom with space to work, hang tools and store equipment. Long-lasting vinyl-coating over galvanized steel has five times the coating thickness versus standard steel buildings. 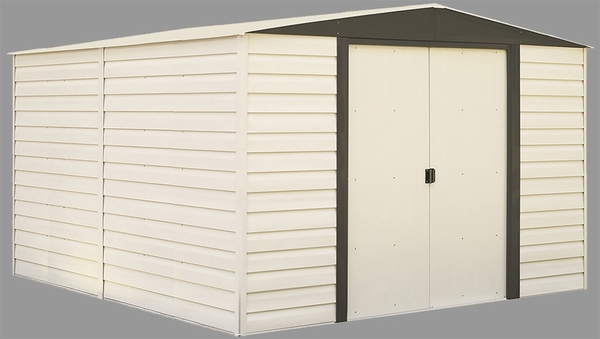 This Vinyl Dallas 10' x 12' shed boasts 115 sq./ft of storage. Good purchasing service from this manufacturer will keep me as a regular customer. We bought this shed about ten years ago. It's been a great place for my father-in-law's ride-on mower and other lawn equipment. It still looks great after ten years, and the doors are tracking perfectly. This past winter we had excessive amounts of snow accumulation, and late into the winter the roof collapsed under the weight of the snow, which had melted and frozen was getting too heavy for the stock roof. The rest of the shed stood strong. A call to customer service proved to be very helpful. Arrow offered to split the cost of the replacement parts with us 10 years after our purchase. Customer service asked for a copy of the manufacturer label inside of the shed, but there was none. My father-in-law had saved the owner's manual and one of the box labels, and that worked for Arrow. Just ordered replacement parts AND the Snow Kit, which we should have had installed from day one. I'm very satisfied with the quality of the construction (in spite of the roof collapse, which was not the mfg's fault), and really impressed by the strong backing of Arrow on a 10-year old product. The ice cream on the pie is that they are made in the USA! ProsMade in the U.S.A.!, Quality of Design & Construction, Friendly Customer Support, ARROW stands behind their product over ten years after our purchase!